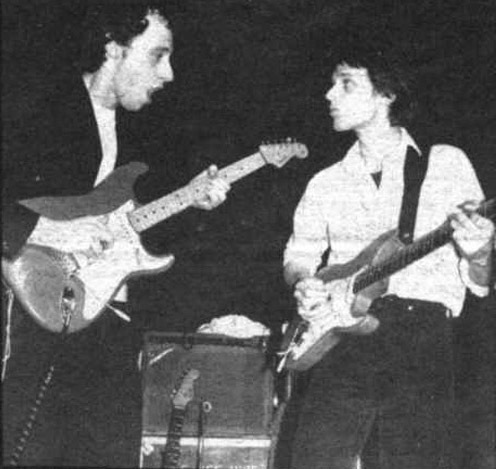 Mark Knopfler got his first Strat only shortly before Dire Straits were formed. Before that time he had played a Gibson Les Paul Special through a Selmer tube combo amp in a band called The Cafe Racers. It is not clear if he owned the Selmer amp or if it was borrowed. What we know is that when he got the Strat, he plugged it into a Fender Vibrolux which probably belonged to Dire Straits’ bass player John Illsley. Today however, it is still in Knopfler’s possession. This amp was a Fender Vibrolux from the early 60ies – from the brown-tolex era. Internally Fender called this model 6G11 (first revision), or 6G11-A (second revision, the more common version to be found). The brown Vibrolux is a really wonderful amp: with about 30 watts from two 6L6 tubes it has enough power to be played in a band with drums and bass, yet it is small and light. It has one 12″ speaker (an Oxford 12L6 or 12M6) and a tremolo effects. Unfortunately it has no reverb (a feature Fender introduced with the later black face series, the only brown amp with reverb was the 2 x 10″ Vibroverb from about 1963), with reverb the Vibrolux might have been the ultimate small combo amp. The rectifier is also a tube. The controls are pretty much standard: One channel with Volume, Treble, Bass, the second channel with Volume, Treble, Bass, and two tremolo controls (Speed, Intensity) which affect both channels. There are no bright switches – another feature introduced with the black face amps. However, the second channel is called “Bright” as a small condenser across the volume poti adds some treble – the same circuit as a bright switch, just not switchable. 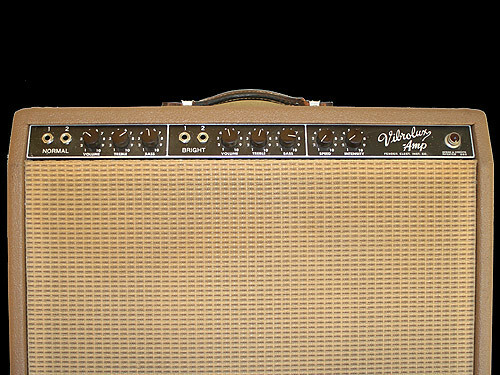 The Vibrolux does not have a Fender logo on the front grill cloth – the one on Knopfler’s amp is not original. From the time of Golden Heart – Note that the Fender logo is not original. It is that far in the corner of the front grill because there is no wood under the grill cloth to hold any screws. 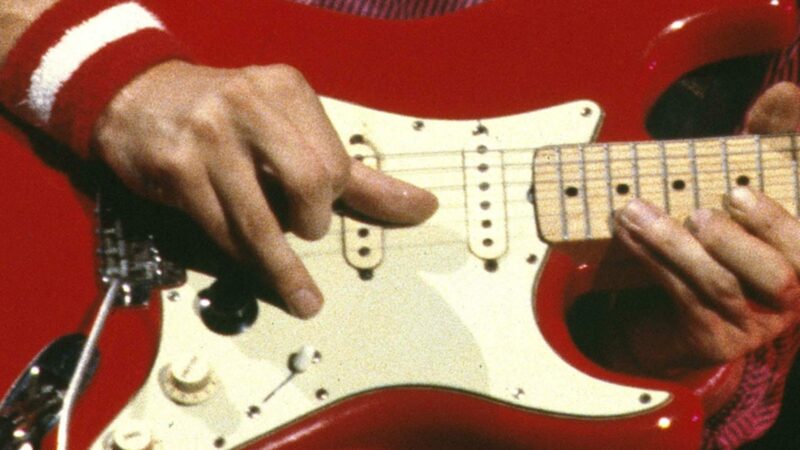 a) Knopfler himself said in a an interview that Sultans of Swing was first written in open tuning on a National steel guitar, but it was totally changed when he got his Strat and played it through the Vibrolux. c) Two pictures from the Roundhouse, London, January 1978 (more info). e) A personal interview with Chas Herington who was the engineer on both the demo and the single version of Sultans of Swing (both recorded at Pathway studio, July 1977 and April 1978, the song was re-recorded two months after the recording of the first album because the record company wanted more of a rock sound for the single). He also told me that it was mic’ed with a Neumann mic. There is no evidence that this amp was played on the Sultans of Swing version of Dire Straits’ first album (recorded in February 1978). 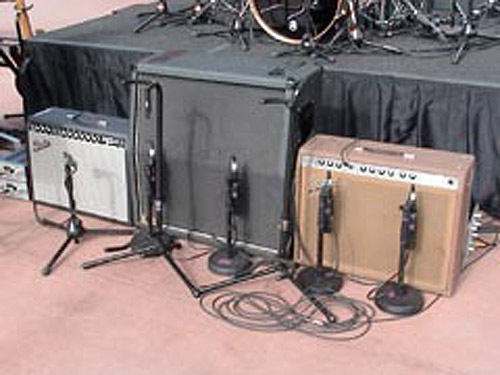 Possibly different amps were used here (Twin Reverb, Jazz Chorus, and the Vibrolux). 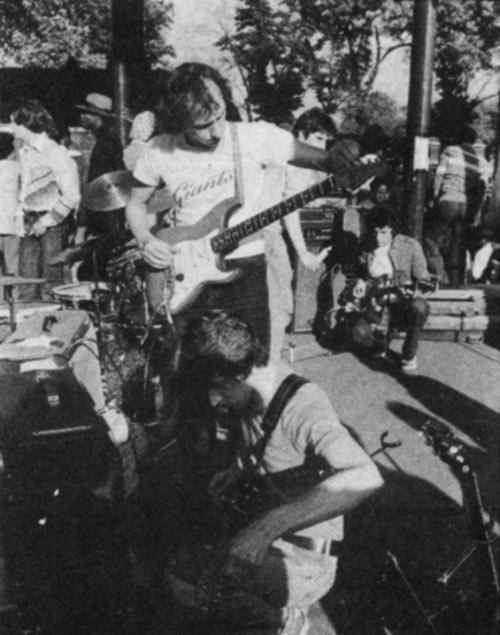 In about May 1978 Knopfler started to play Fender Twin Reverbs on stage. The Vibrolux reapperad with the Notting Hillbillies and is still frequently used these days in Knopfler’s British Grove studio. Great article Ingo. Do you know anything about Knopfler’s use of compressors? Thanks for the article on the compressor, it sounds he could have used one. Right now i’m looking for a brothers in arms type tone straight from my tube amp just by driving it, but it won’t seem to drive enough, although it does a little. Do you know of a way to get it to drive harder without pedals. It seems that it is the same gig as the pics above. 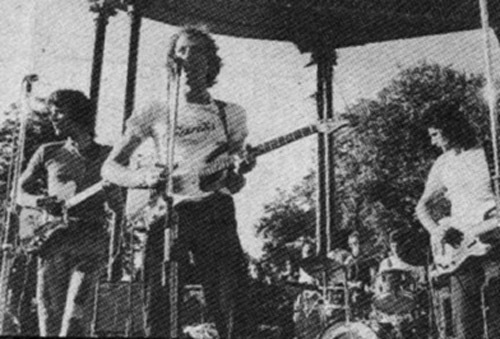 Mark, David and John looks have the same clothes (but maybe didn’t they have so much clothes at that time 😉 ) and it seems they are playing in a “kiosk” (we can see some pillars).You say September 77, so it could be the “summer” in Oldfield`s memory. On the book pic, there`s a strat laying on the right side (David â€˜side as the pic is taken from the back of Pick). Could it be the 80470, or David`s strat as you said that Mark seems to have only the 68354 at that time? And at last, we can`t see the colour as the pic is B&W, but the 68354 is natural finish, right? If I remember correctly (but I can`t find the article where you wrote this) you said that the 68354 was red finish early 78? There is a spam filter for comments that normally works very well, if the filter is not sure it holds back a comment for approval by the admin which was the case here. This sometimes happens when a comment includes some URLs or if the same author makes many comments within a certain time, or just for some other unknown reason. Maybe the picture is bigger in your version, would love to see that. I know of about 5 or maybe 6 pictures of that gig. Can you scan (or photograph) your picture and send it to me (inra311(AT)versanet.de). I think I should put all pics of this gig into a special article then. My band (Scapa Flow) played support to “Brewers Droop” including Mark Knofpler around 1973/74 at the Newark Tech College Hall in England. I sat talking with him in the dressing room about guitars. I was playing a Les Paul custom, he was playing a Strat and was telling me how he liked it and was showing me how the tone/vol and switch worked……….so he must have had a Strat way before the first album? Hey, cool ! I am pretty much sure that he got “his” Strat shortly before Dire Straits started, I would guess early ’77. He had that late 50ies Les Paul Special in the mid-70ies it seems, and I think also at the time of Brewers Droop. Maybe he played a Strat that belonged to someone else (e.g. the other guitar plyer in the band). I think at the time of the Cafe Racers he also used to play a Telecaster that belonged to the singer. 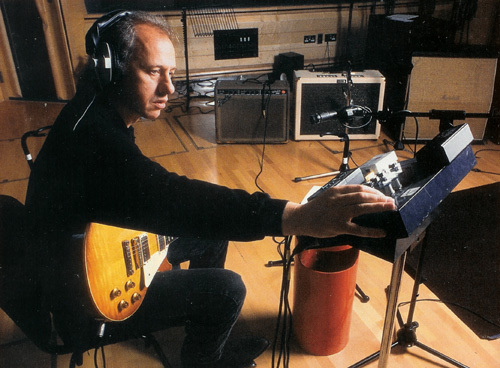 Can the first song of dire straits were recorded with a deluxe reverb? The tone is very sweet similar. e.g. on wdytyg, news, down to the waterline.. ? Nobody knows which amps were used on the second album – Communique. They were borrowed from Robert Palmer, possibly Fenders. I once met Jack Sonni (Dire Straits’ 2nd guitarist in the late 80ies) and asked him if he knows what Mark played on that old stuff and he replied something like “I think an old Deluxe reverb or something”, but no idea if this is reliable info or not. Ingo I have a 70s deluxe reverb and is sweet for that tone. Very close. I can’t see how Jack Sonni could know EXACTLY the gear used in 78-79. I guess he met Mark in NY in spring 80 during or just before the recording of Making movies. Of course Jack Sonni colud not know anything first-hand, I thought maybe Mark told him something. I asked generally about gear on those first DS albums. I’m sure except the vibrolux the other amp was a black face fender as you said Ingo. is Mark really using a Shure SM 57 on picture 1 for vocals? And what’s the desk in front of him? I think he just records guitar overdubs and the mic is just a talkback micro so that people in the control room can hear his requests or comments. The desk might be something to adjust headphones volume I’d guess. You read in the article that he used a Les Paul Junior through a Jim Kelley amp (cited in the article as a “Kelly” amp, but I got to ask MK about that a during the recording of the Sailing To Philadelphia album, and it’s definitely a Jim Kelley 1×12 combo), so there’s your starting point. The big trick is getting that hollow, nasal sound to the guitar. I’ll cut to the chase- it’s not guitar wiring tricks, it’s not a wah pedal or any other kind of pedal, or anything else pre- guitar amp. Jim Kelley amps are very Fender-like and have that same “squawy bark” when they’re pushed hard, so that’s the first big clue. But like Fender amps, they don’t have THAT sound that we hear on Money for Nothing or Brothers In Arms… Simply put, that sound came from the way the microphones were aimed at the amplifier. So: that sound we’ve all looked for at one time or another is actually two microphones that are playing with each other’s frequencies to create: a hollow/ nasal guitar sound. Bummed? I was. How do you replicate that live!? I asked MK that question, and his solution: “I use a wah pedal.” Well, I figure if it’s good enough for him…! Ingo, which is the bias of the brown vibrolux, hot, cold? I set mine deluxe at about 23 ma – how this you think will compare to the brown vibrolux? (I know it has a fixed bias) I want set it as hot as the vibrolux. Sorry, I can’t tell, never measured it. The brown vibrolux is specified with a grid voltage of – 36 V, but it has only 365 V plate voltage, so the cathode current should definitley be different from your 23 mA anyway (the Deluxe has more than 400 V) . I normally start with this value and set it so that it sounds best, at the same time trying to avoid it running too hot. Which speaker you think friend Ingo is best from the two, oxfords or jensen vintage? For the early staff. I have an 12L6 from ’71 and I’m think of buy a jensen from mid 60s but reconed. Which channel on the vibrolux is more knopflery Ingo? Both channels are the same except that the right channel is brighter. It is the same circuit as you have with the bright switches that you normally have on Fender amps, just without switch, in other words, the bright capacitor is always on, and on the left channel always off. I’d vote for the right channel to be more knopflery.